In a mixing bowl, add first four ingredients and stir together. Add the remaining (wet ingredients) and mix until a sticky dough forms. Make a ball out of the dough, pressing it together, then place it on a sheet of plastic wrap and form a cylinder or a log (the log will be over a foot long, so if you'd like, you can cut it in two so that the logs are easier to manage/less deicate). Wrap the log tightly in the plastic wrap and place in the freezer for 30 minutes or in the refrigerator for 2 hours.When ready to bake, preheat the oven to 350 degrees F. Unwrap the cookie dough, place it on a cutting board, and slice 1/4-inch thick slices to form cookie shapes. Place dough on a baking sheet and bake for 13 to 15 minutes, or until edges are golden brown. 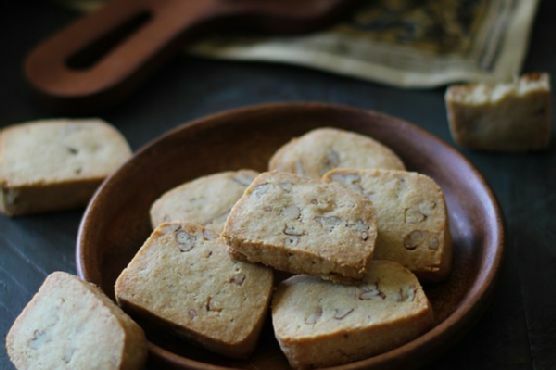 Cream Sherry, Madeira, and Prosecco are great choices for Shortbread Cookies. Sweet bubbly Prosecco doesn't overwhelm simple sugar or shortbread cookies, a sweet cream sherry complements spiced cookies, and madeira's nutty notes match cookies with nuts perfectly.